28 posts categorized "Web World"
Have you every wanted to spend a year exploring art museums from around the world? Google's Art Project will help you do just that in a few moments. At their new site, http://www.googleartproject.com , you will discover and view hundreds of artworks using their street view technology. You will be able to view all the works of art with incredible zoom levels, and even create and share your own collection of masterpieces. The sweet smell of boss can captures the night life perfectly. The site pulls in live tips and facts about how to have a great night life while wearing your Boss in a city where the nightlife is about to begin. I have to files this one under fool election findings. EveryMoment Now provides "context and scope to the moments shaping our world." If stories 'above the fold' are important and those 'below the fold' secondary, then EveryMoment Now is looking 'behind the fold'; (fig 1) that is laterally, through time. Moments connected with an event both above and below the fold are brought next to each other to gain insight into the now. Being able to see these spikes (variance) in news coverage over time will illuminate potentially hidden patterns, stories or correlations. Providing a simple, clean and intuitive interface to this data will allow quick access to and assessment of these patterns and stories. 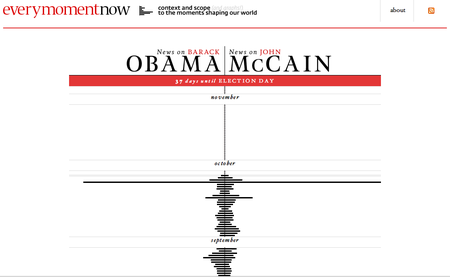 EveryMoment Now aims to illuminate the news through this historical context. EveryMoment Now was built and designed by Craig Mod, a Tokyo based designer and developer. My Favorite DiggNation this year. Inside the Attack that Crippled Revision3, Radiohead to Prince, Canadian Border to check iPods, Gun T-Shirt a Security Risk, Metal Gear Solid 4, Can you see a Spider?, The Internet Will End in 2012. This coming week I will focus on looking back and learning, but more importantly looking forward from those learnings. All of it will manifest itself in Top 10 category lists. Today I start with a spotlight on Bruce Tempkin of Forrester and the Customer Experience Matters blog. What I love about this top ten list is that he gift-wrapped the top ten "Customer Experience Resolutions". To create great experiences for people (consumers, yes, they are people) you must first bake it in to your culture. If you are working for a company that doesn't have a culture of customer-centricity baked into it, then it will be difficult to achieve any of these goals. If your company never had it—you will have to figure out how to build that culture or move to a company that exudes this culture.